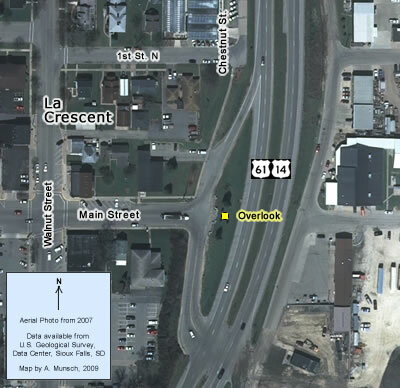 Located In: La Crescent, Houston County. The La Crescent Overlook is located along the west side of modern U.S. 61/U.S. 14, just north of the junction with Highway 16 at the east end of Main Street. It is accessible via an exit ramp to Main Street from U.S. 61 southbound. The overlook was constructed in 1941 by the Department of Highways as part of the upgrade of U.S. 61/U.S. 14 into a divided highway between La Crescent and the Wisconsin state line. The structure consisted of a stone wall with metal railings and two stone benches. Flagpoles were added in a 1992 restoration by the local community. 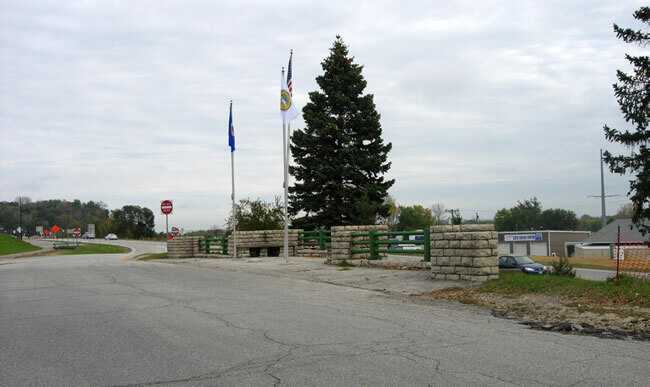 The overlook was once referred to as the "heave-ho" or "heaving rail" by locals (according to the MnDOT inventory report). The report posits this name came from its use by transients who had a habit of heaving empty bottles towards the highway and/or vomiting. Photos - Taken in October, 2007. The stone retaining wall and bench structure at the east end of Main Street, looking north. The exit ramp from U.S. 61 southbound is on the right. 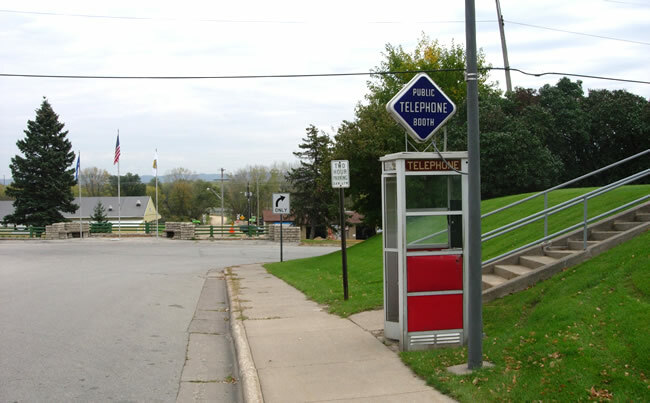 A public telephone booth on Main Street in La Crescent in remarkably good condition. The overlook is just ahead.